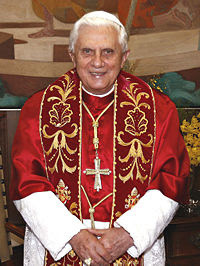 Ok, as I was sipping my Passion Tea Lemonade this afternoon thinking about ways to finish a writing project on which I have embarked, I came across some news online re: Pope Benedict XVI, or as he is known in Southern Germany, Joseph Alois Ratzinger. LORENZAGO DI CADORE, Italy -- Pope Benedict XVI has reasserted the universal primacy of the Roman Catholic Church, approving a document that says Orthodox churches are defective and that other Christian denominations are not true churches. The document, released Tuesday, restates key sections of a 2000 document that set off a firestorm of criticism among Protestant and other Christian denominations. It said they were not true churches but merely ecclesial communities and therefore did not have the "means of salvation." I gues alienation is being used as a form of attraction. Who knows these things, after all? Catholic love, I guess. Ratzy- setting back ecumenical relations a hundred years. You'll never catch him at the wailing wall. In the 60's at the U of Tuebingen where Ratzy was faculty, the students protested loudly about his authoritarian classroom. It was so roudy, he fled the room. (Unheard of in those days of emphatic decorum). Guess now he's got a captive audience. Right, Joanna. I spaced Tuebingen. Right. Authoritarianism is passe, Ratzy. Get over it and get with the program.